PPT to EXE Converter can help you to generate Personalized output exe file. For example you can set private icon images for output exe file and configure your picture images before or after presentation. The image support not only JPG, BMP,EMF but also PNG and GIF file, so, you can make your own irregular or animated welcome interface.PPT to EXE Converter runs easily and independently.PPT to EXE Convert can Personalize your EXE file. ...... way to ensure that everyone can read your presentation (no matter whether they have installed the needed version of PowerPoint on their computers) is to convert to a self-running EXE file using PPT to EXE Converter. 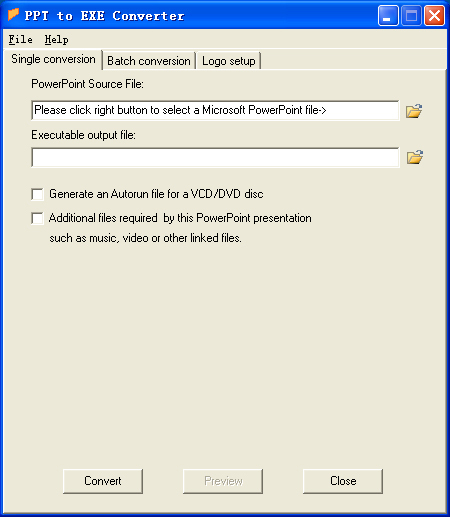 PPT to EXE Converter can be run without Microsoft PowerPoint installed. And the converted self-running exe file does not require Microsoft PowerPoint installed on your viewer's computer too. PPT to EXE Converter is an ideal solution for distributing PowerPoint presentations. It doesn't take imitation way, it can view full-featured presentations created by PowerPoint 97 and later versions, that is to say the converted exe file is exactly the same as the original PowerPoint PPT file. * PPT to EXE Converter can do Single conversion and Batch conversion. Download exe installer setup maker to convert .NET framework MSI to exe package. Qweas is providing links to PPT to EXE Converter 5.36 as a courtesy, and makes no representations regarding PPT to EXE Converter or any other applications or any information related thereto. Any questions, complaints or claims regarding this application PPT to EXE Converter 5.36 must be directed to the appropriate software vendor. You may click the publisher link of PPT to EXE Converter on the top of this page to get more details about the vendor.